Now 1000’s of historical prices are available for free! The price shown on each product page is the approximate price that was paid for an item on the given date. This can be used as a guide when checking prices for purchasing from the second-hand market. 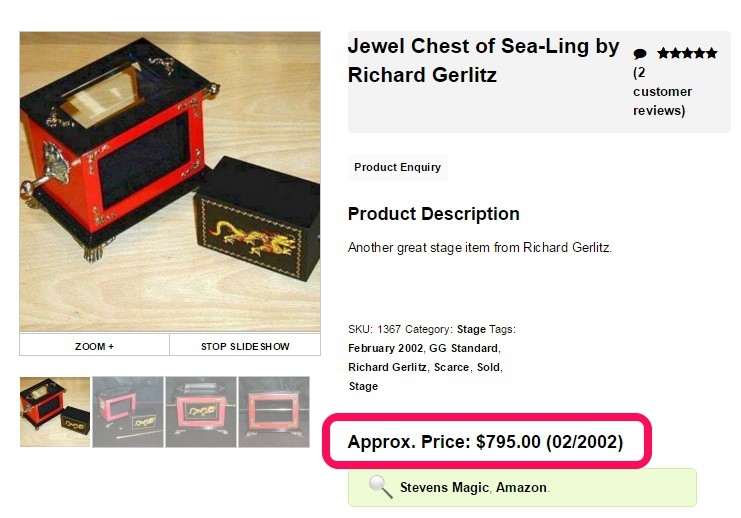 However, for some items, the price could be wildly different, for example the Jewel Chest of Sea-Ling by Richard Gerlitz shows a price of $795 in 2002. You’d be really hard pushed to get one for anything close to that price today. Sometimes I will update the price if I see a newer price, but in most cases it will be the price available at the time of purchase. Many sites and auction houses charge for this historical pricing information, but here at MartinsMagic.com it is all free. I hope it helps when making purchasing decisions for used and rare magic, but it is just a guide and I take no responsibility for the accuracy of the information so please take that into account when purchasing used magic.